Today, we best know the Opel Insignia as both a really nice Buick and the replacement for Jeremy Clarkson's most hated car, the Vectra. But once upon a booming economy, General Motors' European brand hand other, more ambitious ideas for the Insignia name. Just a few weeks after everyone in the Northeast emerged from a three day blackout, and two months before Operation Red Dawn concluded with the capture of former Iraqi dictator Saddam Hussein, a furiously lumbering General Motors rolled out of its corporate darkness into the 2003 Frankfurt Motor Show on a mission of its own. That mission was to generate some fresh buzz about its central European brand Opel who, outside of the Lotus-based Speedster, wasn't known for building cars any sharper than an old wet dish rag at the time. So they introduced a brand new third-generation Astra that made the outgoing model look like what you'd find thrown halfway across the floor of a monkey's cage. But that wasn't the only car they rolled out into the spotlight. There was also a new concept model meant to showcase what the company was thinking of to replace the Omega flagship sedan, which was about as flavorful as a sundae made out of Elmer's glue with grass seed sprinkles on top. And what they came up with was an interesting car indeed. As evidenced by an early interior drawing, it was originally to be called the Olympia. But, at some point in the process of making it, they changed the name to "Insignia," and it followed a pretty ambitious premise: if Opel was going to have a flagship car that could woo Audi and BMW buyers, it could no longer offer it in a traditional four-door format. It had to do something innovative, something different. It also had to look distinctive. What they came up with seemingly started out as a sedan because it had four total doors, but the lack of rear door handles and a dramatically sloping roofline suggested that it was more like a coupe. Around back, there was a gigantic liftback that said it was neither a sedan or a coupe but actually a hatchback. As confused as an onlooker might be, it certainly didn't leave them feeling like they wanted to sit back in their easy chair and dazedly channel surf with their hand halfway down the front of their pants. Opel then topped this rolling buffet table of a car off a massive grille up front befitting of a steam locomotive, handsome androgynous lines with masculine chunkiness but feminine sleekness, tiny front overhangs and long front fenders, and the whole thing sat on four stupidly huge tires. All of that meant the bizarre Insignia had something the Omega didn't have — presence. It was full of clever little features as well. The rear doors didn't open out but instead sort of slid back on something called a "pantograph hinge." And while I've managed to unearth the press release from the deepest pits of the internet, the explanation of those door hinges is so hilariously convoluted I won't bother to repeat it here and bore you to your early grave. Basically, the hinge allowed the designers to make the doors slide back like what you'd see on a Dodge Caravan parked outside of a soccer field without the use of an ugly track. Inside, there was leather and wood almost everywhere and a full-length rear center console that could magically be turned into a backseat via a hat trick if you needed to seat a fifth person. If you decided to tell that fifth person you were sick and weren't going anywhere, that console also housed a DVD player, a humidor for your cigars, and a fridge for two bottles of wine. If you could find a quiet place to park and pinned up some curtains over the windows, the back of this car would've been perfect for wife swapping. Underneath the slick yet confusing bodywork, clever doors, and subtly perverted interior resided a small-block V8 borrowed from the Chevrolet Corvette and that meant it could move under its own power. Some sources also state there was a seven-speed automatic transmission hooked up to it, but I seriously doubt that. The chassis was interesting too because it was essentially borrowed from the VE Commodore that was still in development back then. Talk about irony. In the past, it was always Holden who turned to Opel for the parts necessary to build the range-topping Commodore and that meant they had to use the Rekord and Omega as their starting point. But here was Opel using Holden's completely brand new rear-drive large car platform in what they were thinking would be their next top-of-the-line car. It was all part of a bigger picture. GM HQ in Detroit was so impressed with the VE Commodore's platform — known to them as the Zeta platform — that they intended to not only use it in Australia, but all around the world. Chevrolet would get a new rear-drive Impala and a new Camaro. Pontiac would get a new retro GTO and a car people would actually want to buy to replace the flabby Bonneville. Buick would get a real luxury car to replace the bucket of rice pudding they called the Lucerne and there was even talk of building a world-standard Cadillac on it. 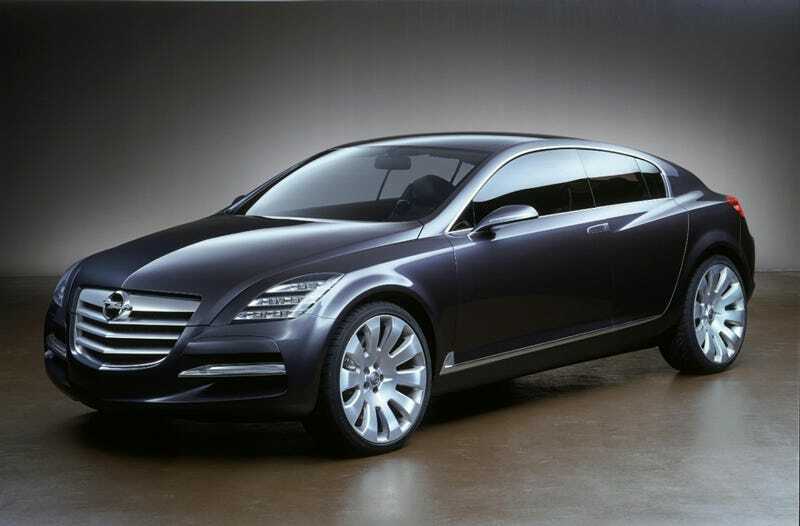 And Opel was to get a version of it that would replace the Omega, and that's where the Insignia concept fits in. Unfortunately, that plan couldn't have happened at a worse time. GM was finally starting to reap over twenty years of bad management decisions and bad purchases. That meant the money they had allotted to building that host of Zeta-based cars was running out quickly. Realizing they needed a quick spot of money, they reallocated that remaining bit of cash to the bullion-minting GMT900 pickups and SUVs and put the Zeta cars on the shelf. Once currency started flowing in again, they resumed work on them only for a global financial crisis to hit them up their backside. As GM slid down the black hole to bankruptcy, only two cars out of that initial seven wound up at dealers; the Chevy Camaro and Pontiac G8. If Opel had built the original Insignia concept, would its flashy doors and ritzy hotel room interior have stolen buyers away from Audi showrooms? That's a good question, since more than likely both of those things would've been toned down a bit for production and it wouldn't have had a badge with cachet. But, now that the name is attached to a mid-sized front-wheel drive mainstream sedan that's been turned into a Buick, that question will have to remain unanswered. Follow Blake Noble on Twitter @ignitionist, and visit Ignitionist.com or follow Ignitionist here on Kinja to see a full collection of ramblings, musings, and rants. All hate mail, tips, and kudos can be sent to theignitonist@gmail.com. Thanks for reading!